Have spent a lot of money on your DVD library and wish to get full entertainment of them not only on home standard DVD players but also bring them with you on your smartphones, tablets when you going out or stream to your large screen TV via home media server. Why not rip the DVD into a digital format with a reliable DVD Ripper program, so that you can distribute it anytime and anywhere as you like. 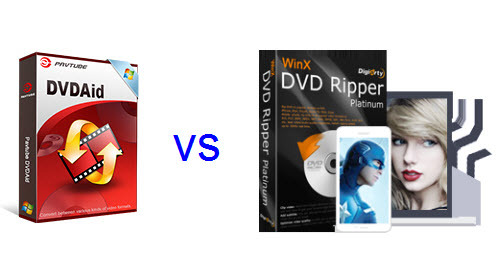 The following article will introduce good DVD Ripper software: Pavtube DVDAid and WinxDVD Ripper for you. Not knowing how to distinguish one from another, just take a look at the following side by side comparison chart. From above comparison chart, we can see that Pavtube DVDAid offers more beneficial editing functions such as splitting, watermarking, flipping, applying effect, deinterlacing, removing/replacing audio in video, etc than WinxDVD Ripper to assist you get your desired video without applying to any third-party tools. While WinxDVD can assist you to backup DVD to ISO image file so that you can later burn to DVD disc. What is the Difference Between DVD Ripping and Copying?